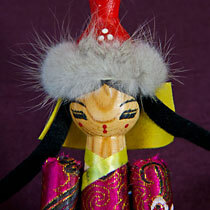 Wooden female doll from Mongolia. 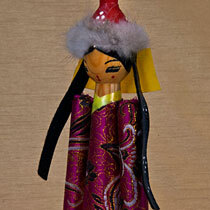 Her head is a wooden ball, and her arms are made are from cylindrical wood. The body is a cone-shaped piece of finished wood. 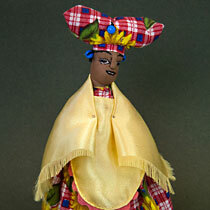 The woman’s traditional clothes are made from rich brocade cloth, which is glued to the wood. 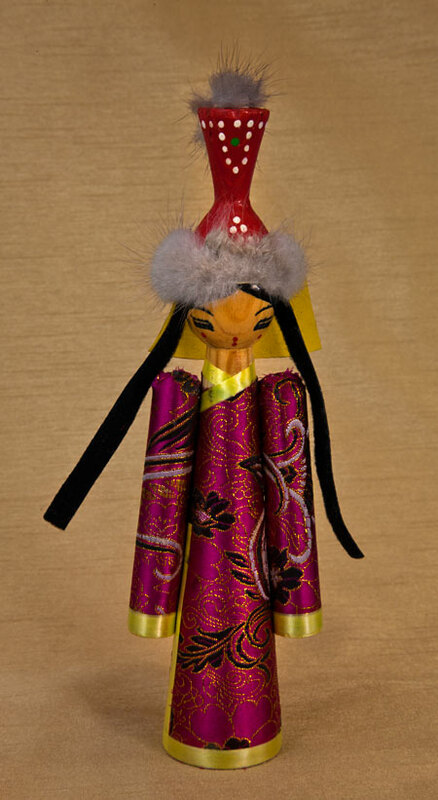 The traditional garment in the culture of Mongolia is call a dell (del). 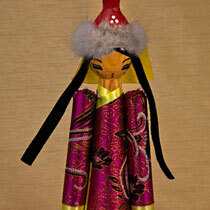 This Mongolian lady has yellow ribbon as trim on her garment, and a wooden headpiece, with fur trim. 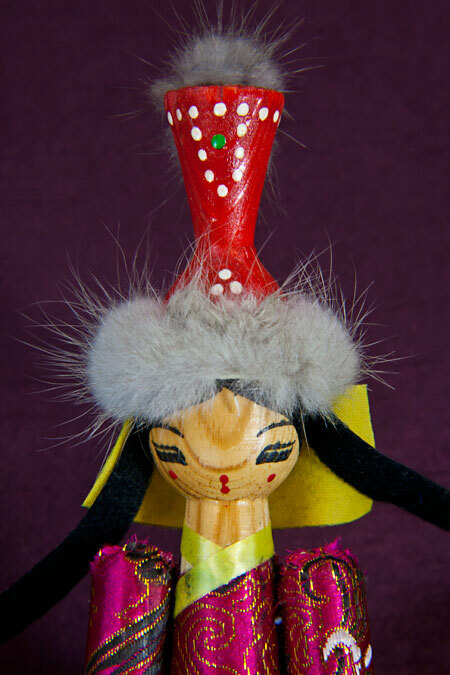 Her facial features are painted on the wooden head. Tomorrow we are going to the Naadam Festival. This is a very famous festival with horse races, archery contests, and wrestling. It started about 800 years ago when Genghis Khan was the ruler. I like the horse races best. The jockeys are boys and girls (between 5 and 13 years old). The jockeys sing a song (called gingo), and then the race starts. It’s a very difficult race. The horses go long distances across the steppes (fields). Sometimes the horses even die during the race. I would love to be a jockey, but Aav (Dad) says our horses aren’t fast enough. Mongolian archers are the best in the world. 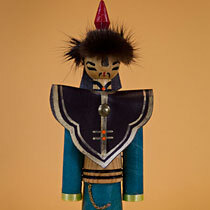 In our culture, both men and women wear traditional costumes and shoot arrows made of willow branches and vulture feathers. The one who hits the target the most times is the winner. The other competition is wrestling. It’s a little different though. The wrestlers stand up. The first one who touches the ground with anything other than a hand or foot is the loser. 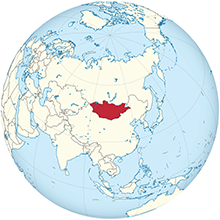 Mongolia is a country sandwiched between Russia and China. It has been ruled by both China and Russia over the years. Now, however, we are independent again. The national spirit, as displayed by the Naadam Festival, has never been stronger.